Please note ... Indonesia and Fiji corals are not currently available. So, this page is now considered an archive page unless something should change ... so, for now, it is being left up for reference only. Thank you! These corals are ordered directly from the source, at the point of origin, in full boxes only, which is approximately 15 to 20 or 25 pieces in the box. This is a perfect way to stock an aquarium, or split an order with a couple of friends if you&apos;re each looking for about a half dozen pieces. Ordering a box and splitting it amongst friends is a great way to save on shipping, since airport to airport shipping rates are much lower than overnight services. It&apos;s also a great way to obtain some rare varieties that often are not regularly seen in your local tropical fish store. This is because they are being shipped to you directly and no one else has picked through your box of corals. There is a variety of availability, so please see the lists so you can get an idea of where the different corals are ordered from. If you are interested in ordering, please send an e-mail inquiry with your airport information so we can ensure that your airport is one we can ship to. Indonesia corals are currently unavailable. Corals from Indonesia typically arrive on Sunday at LAX, Los Angeles, and Monday to you. What Indo calls a Medium 90% of the time is a Large in your mind or a store. What they call a Large is usually XL, unless of some rare variety or color, whence sizing is reduced. Usually there are only a couple of dollars difference in small and medium ... we order mediums, you tell us mostly how good the sizing was, that they are larges locally. We guaranty Smalls and Mediums. Large and XL are ordered at your own risk, as they are really XL and XXL, and a percent of them will not handle shipping. With many items they ship fine, but some people want LG or XL Leathers, Frogspawn (Octopus), Hammer, Acroporas, that just don't ship well from Indonesia. So, if you want to take the chance, that&apos;s fine, we can order it for you ... BUT it is not guaranteed! We will tell you when you are attempting to order a "poor shipper" or no-guaranty item. These prices are FOB (freight on board) LAX, you pay the domestic freight to the airline when you pick it up at your airport. Usually $100 or so for a box coast to coast, varies with airline and destination, western states often a little less, $75-80. Because air freight has a minimum charge and the box is only 50 lbs. or so, you can actually get two boxes for very little more than one as far as shipping is concerned. Usually they leave LAX Monday a.m. so it is a late afternoon or early evening arrivial to your airport. Pick at least 22 pieces or so for a box, usually they come 20, but they need a couple of sub ideas and better from you ... I like to give them 24 items just in case. As they may have the item, but when the weekly permit for export gets issued Friday (the day before they ship), they might not receive an export permit to ship every type every week. From some sources, 20 pieces of the regular medium items is $700, $35 per piece, a "birdfish bargain" if I may say so myself. Most of the pieces sell for double to triple that in the stores. Timor (Kupang) corals are currently unavailable. These are 5-star A-1 pieces of the highest quality and best color and size. It's an extra flight to get it to Jakarta, Indo for the flights to Los Angeles, so extra money, but well worth it. Any given item may or may not show up any given week or order due to supply and or CITES permits. RARITIES ARE RATIONED. Fiji corals are currently unavailable. Fiji has a limited selection but the quality is very high. It is the best place to order assorted wild Acroporas, you can&apos;t choose much about them but they are great mixed Acros. They are very good sized, what they call a medium will be a good full head colony. These boxes have 14-18 medium colonies per box. You must order a minimum of one box from any given source. One box cannot be made up from various, different sources. Your order will be packed for you at the point of origin. 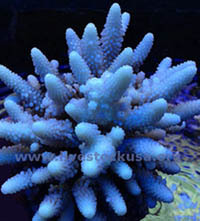 From any single location, you can choose which corals you want in the box. Using the lists, e-mail us your "want list" and we'll send prices back to you. A box of corals will ship for about $80-100 freight on the average to your local airport. Sometimes it's only $60 if you live in the western U.S., about $80 to the middle of the country, and $100 to the east. Remember, we'll need to know your nearest major airport. From any source as needed, heat packs or ice packs are $1.00 to $1.50 each depending on supplier; usually one to two per box are used, varying with temperatures, but sometimes more heat in the winter.